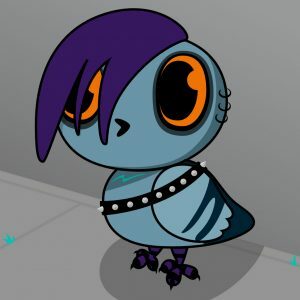 I’m working on a commissioned painting for a goth pigeon in a cutesy style. I am super excited about this project because it has me drawing and painting again, and revisiting a style I haven’t played with in years. I didn’t realize how much I missed this sort of thing. I decided to give this character some nice purple emo hair, a studded (belt or collar?) and some lovely striped socks. His face is mostly covered in make-up so he can look pale, in traditional goth fashion, but you can see a shimmer of green on his neck area which is not covered. I thought it would be fun to add some bits of grass in the sidewalk cracks using the same green, and forming a triangular composition. I’m still gessoing this canvas, and am super excited to start painting!